The imposing big brown building — which is used for training by the Royal Hamilton Light Infantry and the Argyll and Sutherland Highlanders, among other military organizations — takes up nearly an entire city block. Last fall, its outer wall became the focus of national attention after hundreds of people brought flowers, candles and other displays of condolence after Corporal Nathan Cirillo was shot to death at the National War Memorial in Ottawa. But generally speaking, the inside of the building is off limits to the general public. 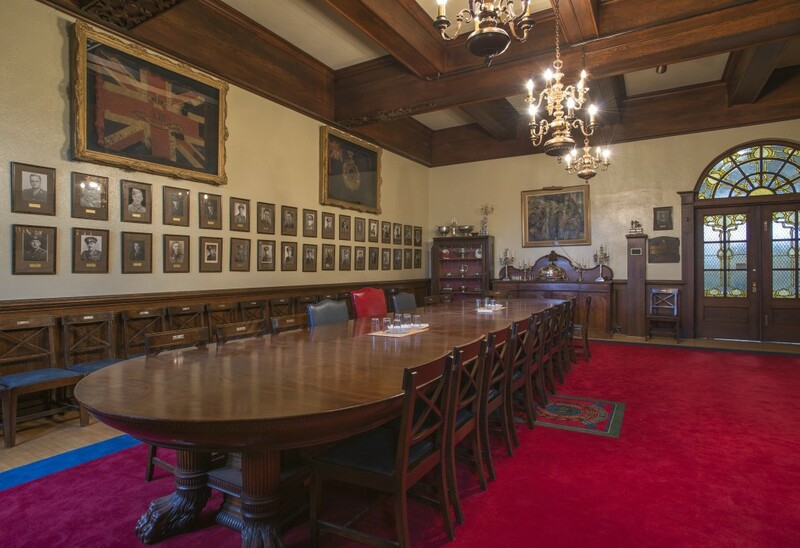 Certainly, the Argylls Officers’ Mess and the RHLI Officers’ Mess require an invite or special permission. Today, as thoughts turn toward Remembrance Day on Wednesday, we take a look inside a remarkable building that has origins back to the 1880s and was expanded from 1904 to 1908. The armoury’s giant drill hall was used to train troops for both world wars, for peacekeeping operations and more recently for military service in Afghanistan. Technically there are two armouries inside, one from the first drill hall built 135 years ago and the other that was added in the early 1900s. But today the facility is officially known as an armoury. He was a chaplain with the RHLI during the Second World War and a Victoria Cross recipient who later served as an MPP in Durham. Foote (1904-1988) received his VC for his heroic efforts helping wounded soldiers on the beach during the ill-fated August 1942 raid of Dieppe in Hitler-controlled Europe that cost nearly 200 RHLI lives. Foote became a prisoner of war and is the only member of the Canadian Chaplain Services to ever be awarded the VC, the Commonwealth’s highest military honour awarded for valour. 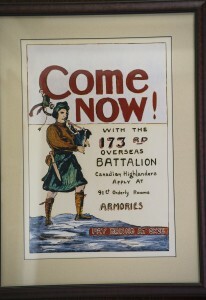 Regiments that use the armoury: The Royal Hamilton Light Infantry (Wentworth Regiment) and Argyll and Sutherland Highlanders of Canada (Princess Louise’s) as well as smaller reserve groups that deal in communications, supplies and transportation. In addition, various cadet groups use the facility. What is a reservist? Reservists are part-time soldiers who have another job, They can be called upon for military service, peacekeeping and emergency assistance. The heavy-wool uniforms from the early days of the RHLI were used when the regiment was known as the 13th Battalion. 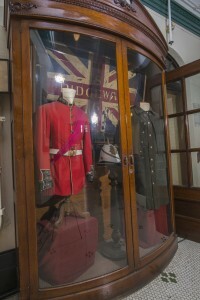 The red one is an officer’s tunic from 1857. The other is a Volunteer Militia and Grey Coat from 1862-1901. 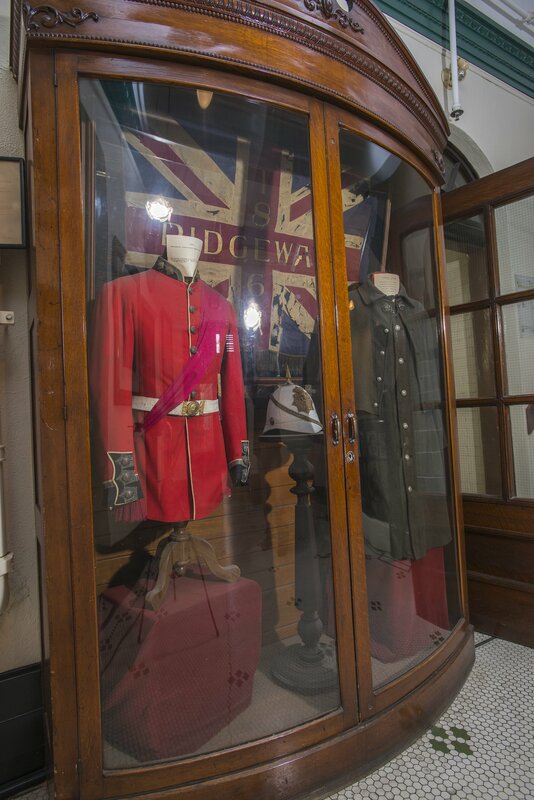 Behind the uniforms — in the display case — is a ceremonial banner or flag created after the Battle of Ridgeway in 1866 during the Fenian Raids and presented to the Regiment. Photo: Gary Yokoyama, The Hamilton Spectator. The giant table was once owned by one of Hamilton’s wealthiest citizens, William Eli Sanford (1838-1899), a Hamilton entrepreneur and senator who drowned in Lake Rousseau. Sanford’s daughter, Muriel Sanford, married Lieutenant Colonel Gordon John Henderson, who was commanding officer of the RHLI from 1921 until 1923. The table went to the Henderson family and ended up in the Officers’ Mess. 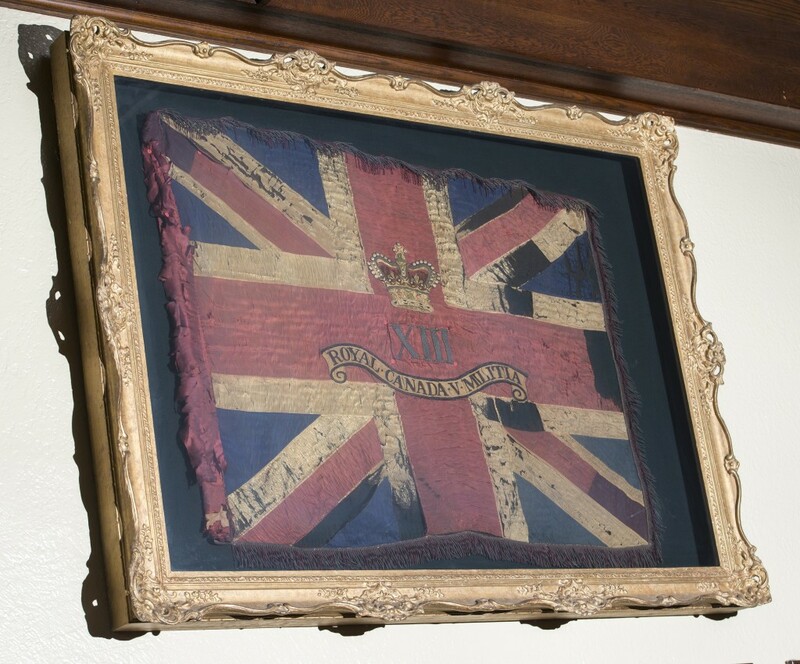 Original pre RHLI regimental flags in RHLI officers dining room Photo: Gary Yokoyama, The Hamilton Spectator. One of two original regimental flags taken into to the Battle of Ridgeway, June 2, 1866, when Irish-American “Fenians” crossed the Niagara River at Buffalo and invaded Canada, hoping to stir up a rebellion. Regimental Colours are the most sacred and honoured possessions of any military unit and are not usually taken into battle. 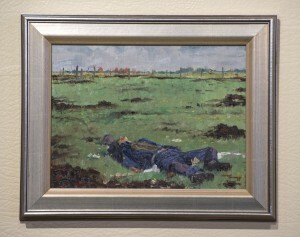 A painting of a deceased German Kreigsmarine (navy) sailor by Second World War Argyll soldier Sgt. Fred Savard. 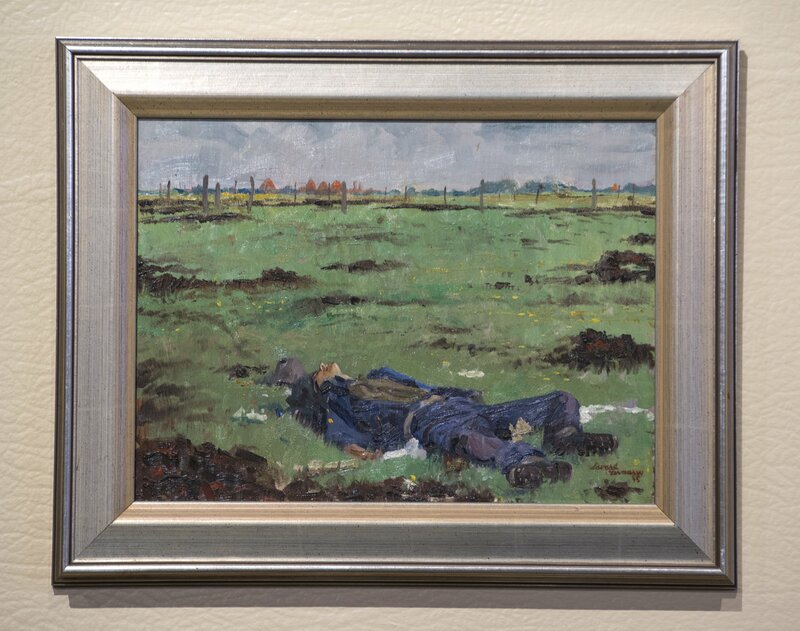 The prolific artist spent much of his free time, while serving overseas, capturing scenes from the battlefield by using scrap pieces of wood to paint on. Christmas greeting possibly signed by Adolf Hitler. Photo: Gary Yokoyama, The Hamilton Spectator. 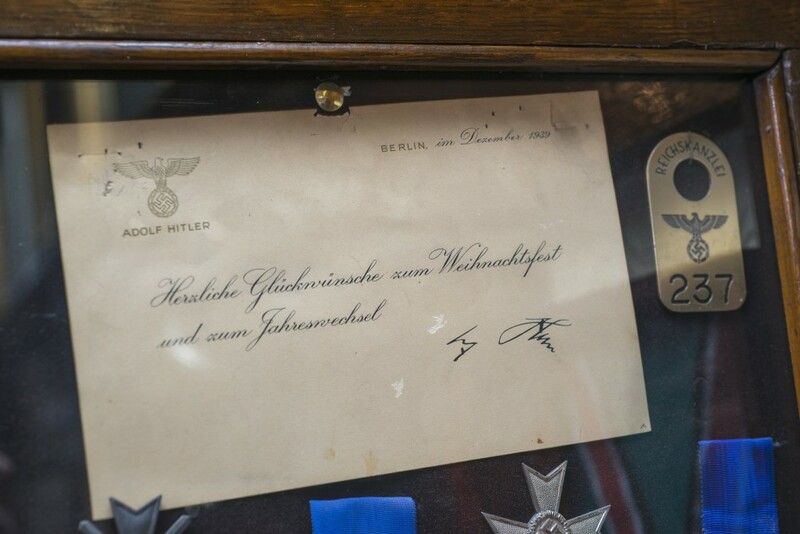 A Christmas greeting card from the office of Adolf Hitler during the Second World War that says, “Best wishes for Christmas and a new year.” It was found after the war by an Argyll and the signature at the bottom is believed to be from the Fuhrer himself. 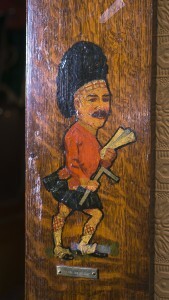 The caricature of Lieutenant Colonel Walter Stewart was painted onto woodwork in the Argyll Officers’ Mess. 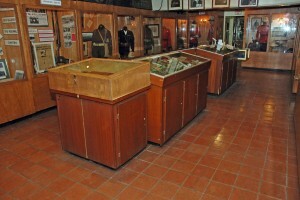 Stewart was an architect in civilian life and designed the new armoury built 1904-08. He was killed in action in April 1917 at Vimy while serving with the Canadian Machine Gun Corps. 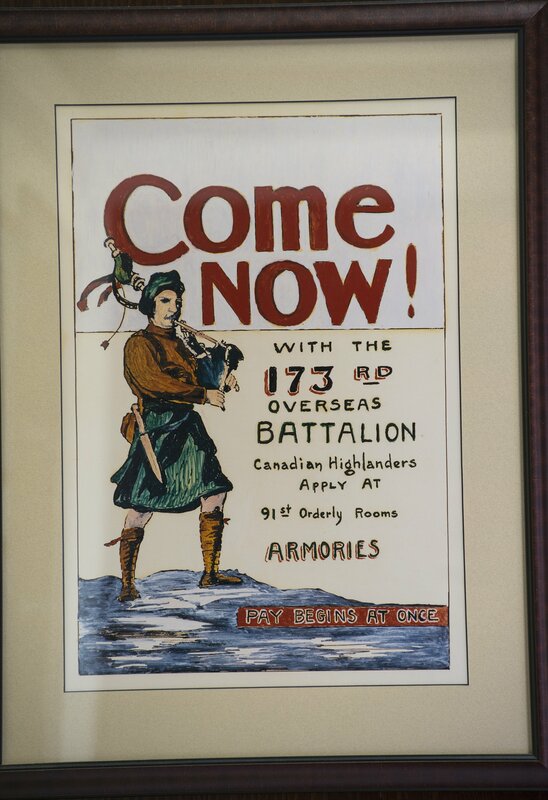 Prior to the outbreak of the First World War in 1914, he was one of the original officers of the 91st Canadian Highlanders, the former name of the Argylls. 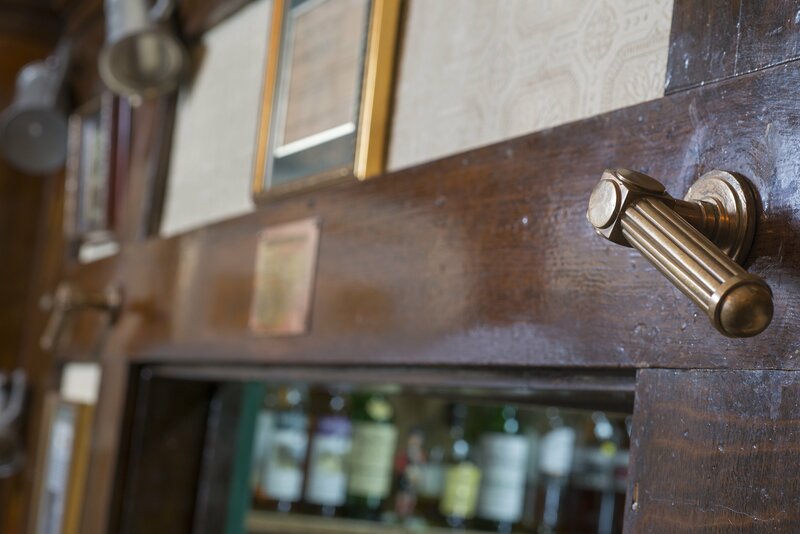 Set of door handles above the Argyll’s bar. The door handles were taken from Hitler’s office in the Reich Chancellory. Photo: Gary Yokoyama, The Hamilton Spectator. Floor inlay of the original cap design of the regiment raised in Hamilton in 1903 as the 91st Canadian Highlanders. The name was changed in 1920, to the Argyll and Sutherland Highlanders of Canada (Princess Louise’s). 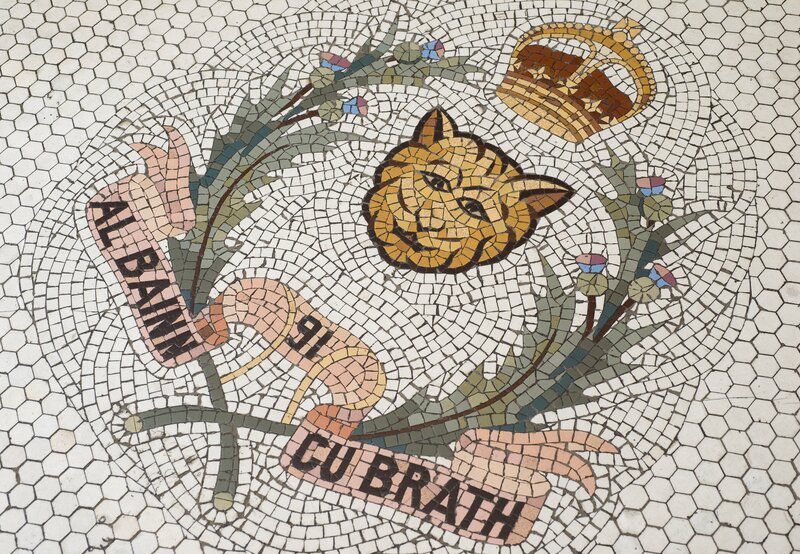 “Albainn Gu Brath” — which means Scotland Forever, a reminder of the regiment’s Scottish traditions — is the regiment’s motto. The RHLI Museum inside the John Weir Foote Armoury is a repository of artifacts for the regiment. For several months, the facility has been closed for repairs and renovations after a broken water line. It’s not certain when the museum will reopen. Photo courtesy of the RHLI. 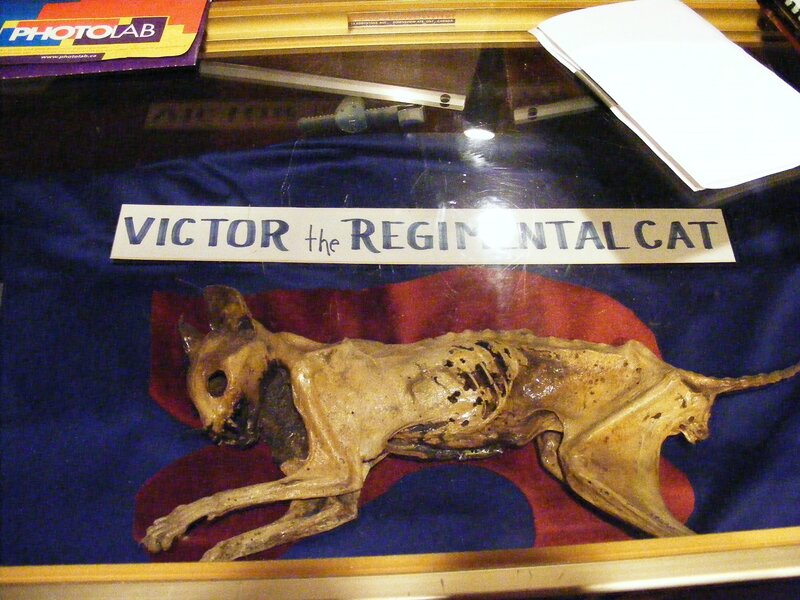 Victor the Cat — a mummified cat found in walls during an excavation at the John Weir Foote Armoury a century ago — is kept at the Royal Hamilton Light Infantry Museum and has become a kind of prankish mascot for the regiment. Photo: Courtesy Royal Hamilton Light Infantry. A mummified feline found in a wall cavity during an excavation a century ago has become an unofficial mascot of the RHLI. 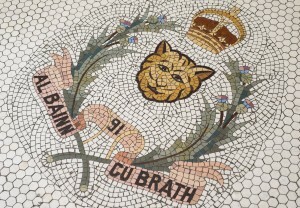 The cat’s remains are kept in the regiment’s museum. 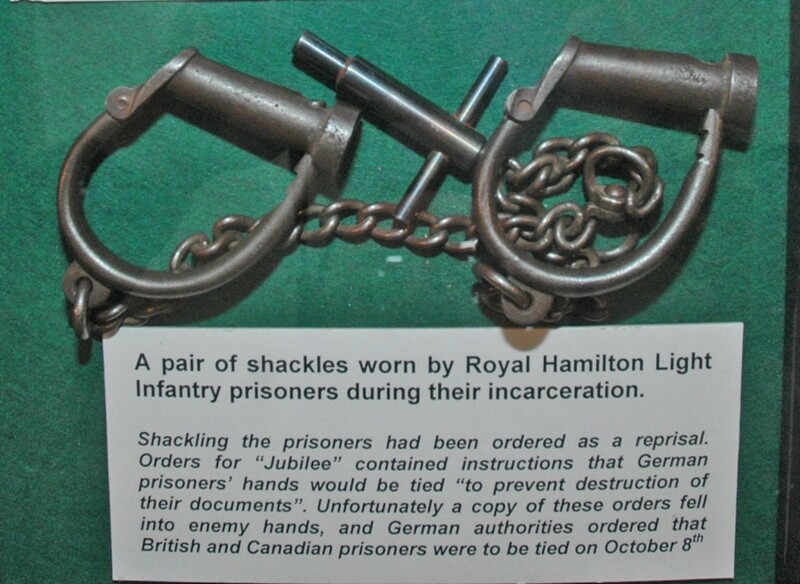 Prisoners of war from the ill-fated raid of Dieppe in August, 1942 were shackled for a period of time after reports that German POWs were being shackled in Allied prisons. After the war, many Dieppe veterans told stories about ways they were able to slip out of the shackles when prison guards were looking the other way.